With major technological and procedural advancements over the years, a dentist’s ability to maximize function and optimize oral health has expanded and improved. Procedures take less time, restorations last longer and treatment plans are more patient friendly. One such advancement, the discovery of titanium dental implants, provides a safe and reliable alternative to patients who have missing teeth. With extensive implant surgery experience, Dr. Raschkovsky, Dr. Greenberg, and Dr. Sims are recognized as leading providers of high quality dental implants to residents of Santa Monica and the surrounding communities. We specialize in both the surgical placement and restoration of implants. Our experienced periodontal team skillfully provides the proper, safe delivery of dental implants. Whether it’s a single implant or full arch replacement, we use 3D imaging and advanced computer guided surgeries to obtain the very best results. Our team of periodontists also uses continuing education to utilize the most cutting edge techniques and ensure patients receive the highest quality of implant treatment. Santa Monica Periodontics & Implant Surgery proudly helps their patients improve oral health and confidence in everyday matters with dental implants. 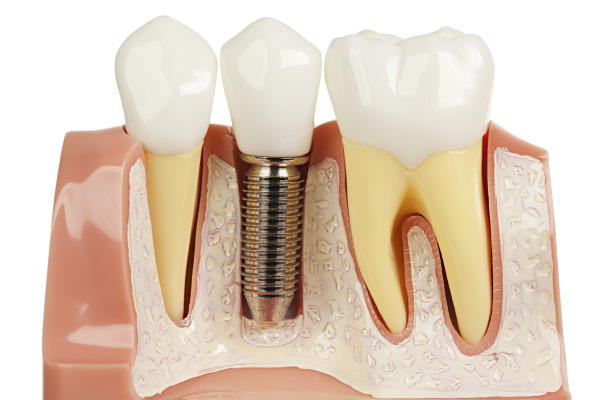 A dental implant is essentially a prosthetic root – a small titanium post, that is fitted with an abutment and surgically placed in the jawbone. After the implant has integrated into the bone, a new tooth (crown or denture) is fixed onto an abutment and functions as a natural tooth. The implant fuses with the existing bone, providing the patient with stability and the ability to assume normal activities including biting, chewing, and speaking. Dr. Ricardo Raschkovsky, Dr. Lionell N. Greenberg and Dr. Thomas N. Sims work together to give their patients a quality experience. Quality of treatment – Computer guidance gives Drs. Greenberg and Sims the upper edge when placing the titanium implant. Exact location and angle will give patients the long-term result. Dental implant placement involves a treatment plan that must reflect the patient’s oral conditions. As Periodontists, Drs. Greenberg and Sims understand the complexities of placement and treat each patient according to their needs. By individually designing the treatment plan, patients receive the best and most gentle treatment to support the healing process. Periodontists understand the management of soft tissue which sets them apart from other professionals. Quality of product – With over 25 years of experience, they only choose the best dental implants available. Less expensive implants are never an option for their patients as they go the extra step to simplify the process and long-term results. Because only the best product from long-established companies are implanted, problems are eradicated from the start. Patients undergoing dental implant treatment will gain a new lease of life. Our Santa Monica patients can count on peace of mind and quality of life among their gains. Don’t let missing teeth limit your life. Our experienced periodontists will provide you long-lasting solutions. Contact our office and find out more about how dental implants will improve your life. We welcome patients from Santa Monica and surrounding communities.